We are seeing slides everywhere this Spring. They are a staple in many designer collections and come in different colors, shapes and fabrics. They range from The Row’s incredible woven snakeskin mule slide (see that shoe on my past blog post) to a number of “must haves” from Gucci. The mule trend is not limited to high end RTW collections. It is an equally important staple in luxury athletic wear. 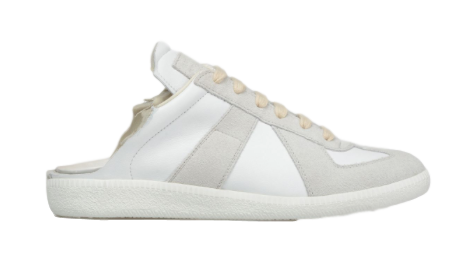 The mule sneaker is the best shoe option to compliment the emerging trend of chic athletic wear and denim this Spring. It is a fresh way to approach the classic sneaker while touching on the ever so popular mule footwear trend. A shining example of when our favored slides meet high end athletic wear is Mason Margiela’s “Replica” mule sneaker in white. It is also one of my favorite mule sneaks for Spring. How do you wear your mule sneakers? The light tonal color pallet is sophisticated and neutral enough to work back to almost anything in your wardrobe. It is a no brainer to pair this shoe with all of your favorite denim but don’t be afraid to experiment. Transform the appearance of a basic dress or pleated skirt with your mule sneaker. There is nothing better than mixing in a great new accessory to elevate the look of your favorite staples. The excitement does not stop with the sneaker! These sneak slides come with a garment bag set – one custom bag for each shoe – that is equally cool and functional. 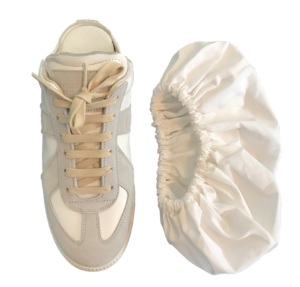 The bag wraps around the shoe to protect it and stays securely in place with elastic (the sole is exposed). Two bags per pair means that shoes can be stored separately – ideal for any closet or suitcase. I’ve actually never seen this style of shoe bag before and I love it. It insures that I will take care of my favorite mule sneaks. The sneaky mule allows you to embrace the look and feel of a classic sneaker. It is convenient, comfortable and cool enough for taking on the warm spring/summer weather by foot. Not that any justification is needed to purchase this “must have” shoe, but why not look cool in a shoe that allows your feet to breathe while you rarely have to deal with tying a shoelace. What more can a shoe lover ask for? !